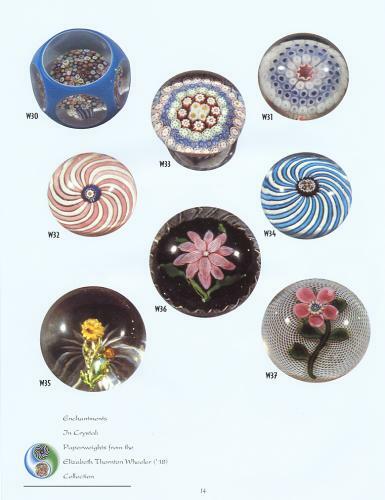 This catalog documents the Elizabeth Thornton Wheeler Paperweight Collection. The collection was bequeathed to the Smith College Museum of Art by Elizabeth Thornton Wheeler. In 1995, to coincide with a meeting of the Paperweight Collectors' Association (PCA), the collection was displayed at the George Walter Smith Art Museum in Springfield, Massachusetts. The exhibition was called "Enchantments in Crystal: Paperweights from the Henry Melville Fuller and the Elizabeth Thornton Wheeler Collections." This catalog describes only the Wheeler Collection. The paperweights from the Fuller Collection are documented in a separate catalog. 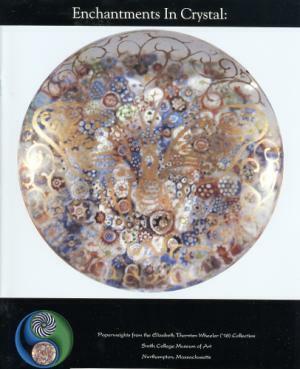 The collection includes 199 paperweights with color photographs of 100 of the paperweights. The pictures are not as crisp as we have come to expect in modern paperweight books, but they are definitely sufficient to aid in the study of this collection. 35 pages with all paperweights in color. 8 1/2" by 11". 1995.